Brie Earrings x Pigment Studio: As soon as my pal Albertine posted these on her Instagram story, I demanded that she tell me as soon as they were available. They are even more exquisite in person and I'm not gonna lie, the temptation to get the other colour is there. They are extremely lightweight too and I love that she's used decent quality studs as well. They don't feel flimsy or breakable like some of the chainstore variants do. Assorted x Lovisa: Lovisa jewels are cheap yes but be cautious with what you buy. I've bought some earrings from them, on sale that have then broken. It is the cheaper ones that haven't held up though so maybe it's just a case of 'you get what you pay for'. On a more positive note, for budget-friendly earrings, Lovisa is my new go-to. 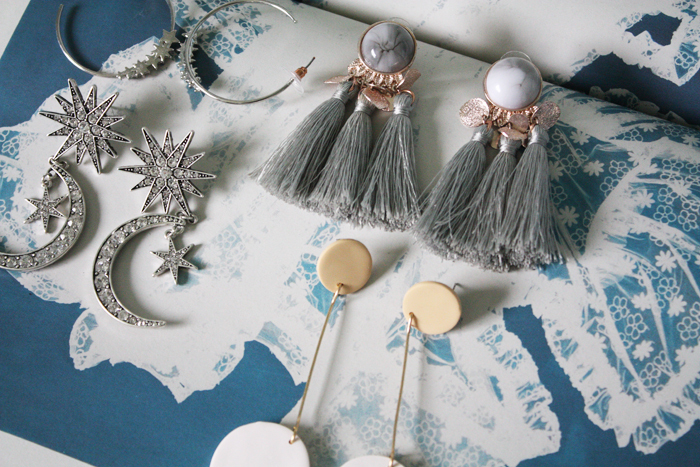 Those celestial earrings in particular are my favourite. I love them. The tassels are also pretty fantastic as well. In fact, Lovisa are bringing it in the celestial themed, Stevie Nicks-vibe jewels department right now. If you're in NZ or Aus, you need to pay them a visit if bling like that floats your boat. -Where's your favourite place to find statement earrings?